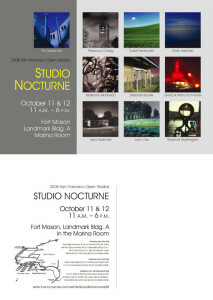 For the fifth year running, I’ll be participating in Studio Nocturne, an exhibition by 10 night photographers that’s part of San Francisco Open Studios. I’ll be showing some new work as well as old favorites. This year, for the first time, we’ll be on the ground floor of Building D, where we’ll have a lot more room. Also, Charity Vargas will be joining us for the first time. Among other work, she photographs the UC Berkeley campus at night. Hours are 11 a.m.–6 p.m. There will be lots of other artists exhibiting at Fort Mason Center, and it’s always a fun show with lots to see, so come on out this weekend! You can learn more about the artists, get links to their websites, see example images, and get more details of the event at the Studio Nocturne 2009 website. I’m again pleased to be included in this year’s Studio Nocturne, an exhibition of work by 10 night photographers that’s part of San Francisco Open Studios this weekend. I’ll be showing some new work as well as old favorites. Click the postcard image for details. Also, you can read bios of all the artists, get links to their websites, see example images, and get more details of the event at the Studio Nocturne 2008 page on the Nocturnes website. Come to Building “A” at Fort Mason Center in San Francisco, where dozens of other artists also will be exhibiting. Hours are 11 a.m.–6 p.m. It’s always a fun show with lots to see, so come on out and say hello! I’m happy to be included again in this year’s Studio Nocturne, an exhibition of work by 10 night photographers, and part of San Francisco Open Studios this weekend. The show will again be held in Building “A” at Fort Mason Center in San Francisco, where dozens of other artists also will be exhibiting. Hours are 11 a.m.–6 p.m. It’s always a fun show, so come on out, introduce yourself, and show your support for the arts! This preview show (which I named—clever, huh?) affords you an opportunity to see some of the work that will be on display at Studio Nocturne (Oct. 13/14 at Fort Mason Center, details to follow). Calumet Photographic is at 2001 Bryant St. (at 18th St.), San Francisco. Hours for the show, which is upstairs, are Monday–Friday 8 a.m.–6 p.m. and Saturday 9 a.m.–5:30 p.m., through September 29. I was there for the hanging, and there’s some nice work up. It’s worth a look. I’m happy to be included again in this year’s Studio Nocturne, an exhibition of work by 13 night photographers, part of San Francisco Open Studios. The show will be held in Building “A” at Fort Mason Center in San Francisco this weekend, where many other artists will also be exhibiting. Hours are 11 a.m.–6 p.m. It was a fun show last year and promises to be just as good this year, so come on out, say hello, and show your support for the arts! Several of my fellow night photographers in the Nocturnes collective are participating in this San Francisco Open Studios preview exhibition. For the fourth time, members of the Nocturnes will be showing our work at Fort Mason Center on weekend three of Open Studios. Our work will be on display through January 28. Details to follow. I’m very pleased to be included in this year’s Studio Nocturne, an exhibition of work by 13 night photographers. The show will be held in Building “A” at Fort Mason Center in San Francisco, where many other artists also will be exhibiting. It promises to be an first-rate show, so come out, say hello, and show your support for the arts! Fort Mason Foundation liked my work so much, they chose to reprint Overpass 1 in their monthly calendar of upcoming events. They’ve also offered me a solo show next July.